With the upcoming release of Dead or Alive 5: Last Round, the recent announcement that Street Fighter 5 will be heading to the PC and the possibility of the new Killer Instinct game receiving a PC port, it’s become more and more clear that the PC platform is now becoming a stable platform for the once scarce fighting game genre. Fighting games of all shapes and sizes have now become playable on this PC, but one type of fighting game in particular has yet to be seen until now. If you have ever played a little known fighting game called “Super Smash Bros” (and if you haven’t: Shame on you! 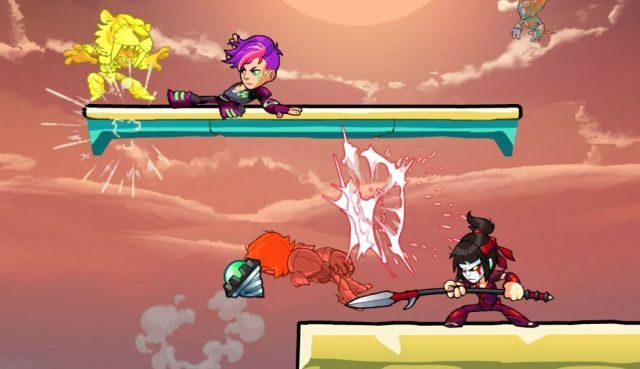 ), then you may be interested in this new title known as “Brawlhalla”, a Super Smash Bros. style fighting game that’s currently available on Steam’s Early Access program. While this game borrows heavily from Smash, it features unique heroes based off of fantasy myth and legends, character customization, online multiplayer and more. All well and good, but the real question on my mind was whether or not the gameplay was unique enough to stand on its own. In the game’s current beta form, it features an arcade mode, local and online multiplayer for up to four players and a tutorial mode. It also features an item mall where you can purchase all sorts of cosmetic items for your characters using real currency. As with any new fighting game, I instantly went straight for the training mode and was introduced to these 12 “different” characters, including Bodvar the Viking Warrior, Cassidy the Cowgirl Gunslinger, Hattori the Samurai Swordsman and many others. However, I use the word “different” very loosely here, because later on as I played the game, I found out that each of the characters weren’t so different from each other. So, for those that have played Smash Bros before, the game’s control scheme and mechanics are strikingly similar: Using a keyboard set up, players use the WASD keys to move and jump in any direction, along with holding any directional key + J or K key to perform different light/heavy attacks. And just like in Smash Bros, pressing and holding an attack button lets players perform powerful smash attacks that will send opponents flying. It also supports two other control schemes including keyboard + mouse and gamepad. In order to get a more down home experience, I decided to go with the gamepad option, and for the most part, the controls feel nice and responsive. While screwing around in the tutorial, I tried to use every kind of technique I could think of from playing Brawl and Smash 4, just to see if any of those skills would transfer over. 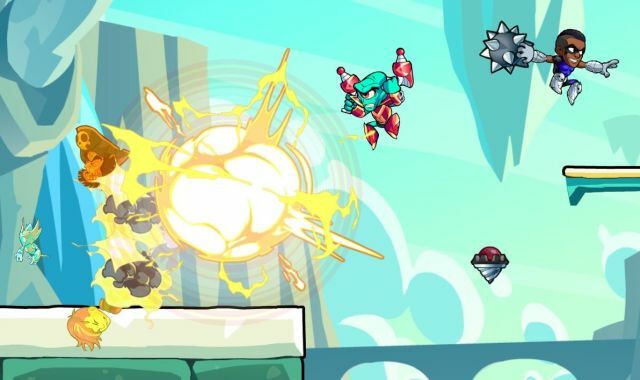 It was easy for me to get used to Brawlhalla’s combat, but there was some differences that I caught onto, like the fact that recoveries are far easier to perform than in any smash bros. game, as players can not only perform double jumps, but up to three upward aerial attacks AND a directional air dodge in order to get back onto stage. As cool as this may be, being able to recover this easily takes out some of tense and gratifying moments when players manage to jump back onto a stage when they thought they weren’t going to make it. After several minutes of training, I decided to play through the game’s arcade mode, which consists of a very straightforward tournament bracket. Defeat a bunch of CPU opponents in 4-man bouts and fight your way to the top. 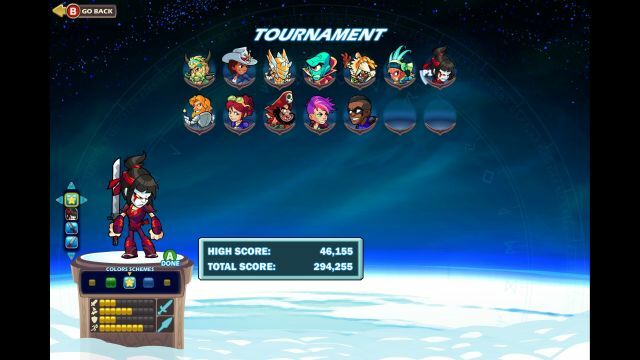 I played through arcade battles several times to get a better feel for the ebb and flow of combat, and I would have to say that battles in Brawlhalla are a bit more reactive than smash, which I feel is a good thing. Frustrating tactics from Smash Bros such as ledge-guarding are much easier to deal with and taking opponents out with a single smash attack is just as satisfying. It’s just too bad that the characters aren’t very distinguishable from each other, as each character must use two out of six different weapon types, including long sword, spear, hammer, rocket lance, dual dagger and dual pistols. These characters do not have much in the way of unique movesets, except for one heavy ground attack, so each sword user plays the same as every other sword user, every hammer user plays the same as every other hammer user, etc. This is one of the biggest issues that I had with the game, as there’s a distinct lack of variety, and the gameplay quickly becomes stale because of it. I’m really hoping that since this is only a beta, each character will start to gain more unique movesets from each other as development continues. The combat is also more item-based than Super Smash Bros, as players must pick up random weapon drops on the battlefield in order to gain their primary attacks. Otherwise, they’ll have to fight with plain old punches and kicks, which do not perform a lot of damage or have much range. However, one interesting thing about item usage in Brawlhalla is that there is no animation delay when picking items up. With that in mind, it was very possible for me to throw an item and pick it up on the rebound, allowing me to create some very interesting combos. There’s something really satisfying about knocking an enemy back a short distance, throwing my weapon at them, picking it up while it’s in midair and then closing the gap in order to finish them off with a devastating smash attack. Lastly, I jumped into the game’s online mode to test my skills against a few live players. At the time i tested things out, online mode didn’t contain any online lobbies or leaderboards or anything like that. Simply pick your character and let the game find a match. Once you’re in, the matches seem to play out fairly responsive, with very little lag hiccups. This could possibly be due to the fact that my current location was very close to the server’s location, but regardless, playing online felt the same as playing offline. I got a lot of enjoyment out of competition against others, and it generally felt nice being able to chat after each and every match and take in all the praise (or rage) that players would give me. 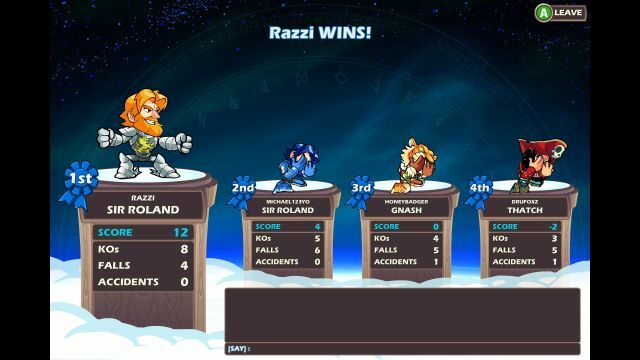 Overall, my experience with Brawlhalla was generally positive, but I am very concerned with the game’s current state of replay value and variety. If they plan to diversify the characters a bit more, as well as add more items, weapons and improve online functionality a bit, then I can see this game become a smash hit… pun intended. The game is currently available in a closed beta, but new users can sign up simply by dropping their email on the official website.